You have immediate access to the computer (you are sitting at it). You don't have immediate access (but someone has). Open the Computers tab in your DeskRoll profile. Click Download, then download and install the app. In the application, click Enable Remote Access. You may be prompted to re-login to DeskRoll if you have two or more web browsers. You will need a bit of cooperation from the user sitting at that computer. 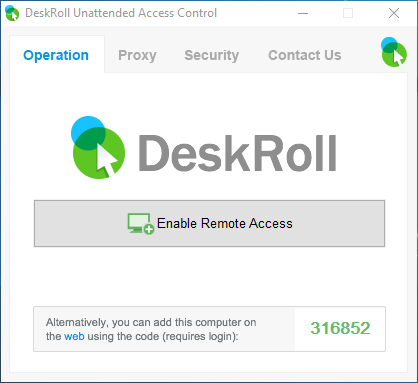 Ask the user to install DeskRoll Unattended Access app (Downloads section at the DeskRoll website). Ask the user to tell you the six-digit passcode. Insert the passcode under the Computers tab in your DeskRoll account and click Enable Access.